A recipe for grilled herb shrimp with chimichurri sauce. 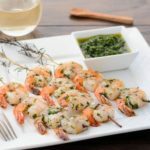 Shrimp are marinated with fresh herbs, grilled on rosemary skewers, and served with a chimichurri sauce. Rinse and dry the fresh herbs. Squeeze or bruise them to release oils. Place them in a jar along with the garlic. Heat the oil to warm (no more than 160 degrees F) and pour into the jar. Let cool to room temperature. Cover and set in a dark place (cabinet or pantry). Remove garlic after 2 days. Use within 3 weeks. Make sure all the fresh herbs have been rinsed and dried (I use a salad spinner to spin-dry). Cut the stems from the parsley and cilantro below the leaves (to have mostly only leaves left). Place the parsley, cilantro, oregano, thyme, rosemary, vinegar, red pepper flakes, salt, and pepper in the bowl of a food processor fitted with a knife blade. Pulse a few times to chop the herbs. Scrape down the sides of the bowl. Pulse while drizzling in the olive oil. Do not over-process or it will become a paste. Transfer the chimichurri sauce to a small bowl. Stir in additional olive oil for desired consistency. Adjust seasoning with salt and pepper to taste. Serve immediately or cover and refrigerate overnight. Recommended to make a day ahead for flavors to develop. Cut the bottom stems from the parsely and cilantro. Finely chop the parsley, cilantro, and oregano. Place all the herbs and the garlic infused olive oil in a bowl. Stir to combine. Add the shrimp and toss to coat. Marinate for 20 minutes. Strip all but the top 2 to 4 inches of needles from the rosemary branches. Whittle or cut the end to make a point. Skewer the shrimp on the rosemary branches. Season with salt and pepper. Grill the shrimp until they are just cooked through, about 2 minutes per side. Serve the shrimp skewers with chimichurri sauce. Total time does not include time for infused oil to set and overnight refrigeration for sauce.